Transcranial Magnetic Stimulation or TMS is a noninvasive procedure (meaning it does not enter the body) that is used to stimulate a part of the brain using a magnetic field. This magnetic field can pass through the head safely and painlessly. 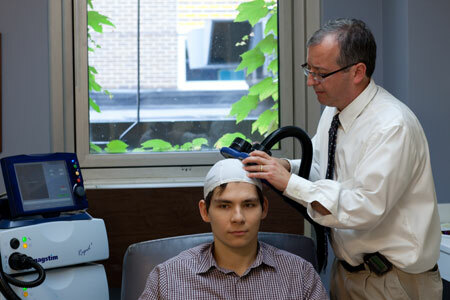 TMS can be used to change activity in the brain and normalize areas of abnormal activity due to illness. Numerous studies have shown that TMS can have a positive effect on mood in patients with depression. The form of TMS used for therapy is called Repetitive Transcranial Magnetic Stimulation, or rTMS. During a treatment session, you will be awake and sitting in a comfortable chair. A coil resembling a paddle or large spoon will be head in place over your head. As the current passes through the coil, it creates a magnetic field that will induce a current in your brain. People receiving TMS often describe feeling a tapping sensation on their head. The TMS coil also produces a loud clicking sound, so earplugs are always provided.